Synopsis (from Amazon): A glimpse into the secret and unique lives of the women behind NFL coaches—game day takes on a whole new meaning as these lonely women turn up the heat off the field. During football season, when NFL coaches gear up for war on the gridiron, their wives are left to fend for themselves. NFL wife B.J. Almond has had enough. When she walks in to find her head coach husband in bed with one of his assistant coaches’ wives, she is livid. But what really sets her off is when she discovers the other wives knew about the affair all along. Now she’s furious and hungry for revenge. And what better way to exact that revenge than to air everyone’s dirty laundry in a juicy tell-all book! B.J. knows where all the bodies are buried, and she’s digging up all the dirt. But before she starts writing, she’s running up the score with a lawsuit against her husband and his mistress. Armed with flight records, copies of naughty emails, phone records, and pictures, B.J. isn’t holding back. And neither are the other football wives, who will stop at nothing to keep their dirty secrets from going public. One (or more) Sentence Summary: Perfect story as football season has kicked off! I love books that incorporate sports (football, baseball and hockey are my favorite). 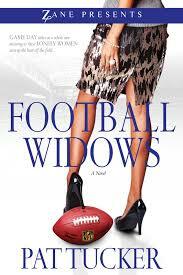 Football Widows is filled with all sorts of dirty secrets. Those coaches wives are too wild to keep up with and has left me wondering how much of the book is really fiction. Is Pat Tucker of NFL the equivalent of Jackie Collins of Hollywood? They are so crazy you won't be left "deflated." Okay, bad joke, I know. Great book anytime of year, but perfect fall read! Would I Read Other Books by the Author: Sign me up for all of them.